If one follows the financial media on a daily basis as I do there is ample room to get both depressed and frustrated over the coverage of the financial markets. Often market movements are described as being very irrational and the description of what is happening in the markets is often based on an “understanding” of economic agents as somebody who have huge mood swings due to what Keynes termed animal spirits. Swings in the financial markets created by these animal spirits then apparently impact the macroeconomy through the impact on investment and private consumption. In this understanding markets move up and down based on rather irrational mood swings among investors. This is what Robert Hetzel has called the “market disorder”-view. It is market imperfections and particularly the animal spirits of investors which created swings not only in the markets, but also in the financial markets. Bob obviously in his new book convincingly demonstrates that this “theory” is grossly flawed and that animal spirits is not the cause of neither the volatility in the markets nor did animal spirits cause the present crisis. The Great Recession is a result of numerous monetary policy mistakes – this is the “monetary disorder”-view – rather than a result of irrational investors behaving as drunken fools. This is very easy to illustrate. Just have a look first at S&P500 during the Great Recession. We can basically spot six or seven overall phases in S&P500 since the onset of the crisis. In my view all of these phases or shifts in “market sentiment” can easy be shown to coincide with monetary policy changes from either the Federal Reserve or the ECB (or to some extent also the PBoC). We can start out with the very unfortunate decision by the ECB to hike interest rates in July 2008. Shortly after the ECB hike the S&P500 plummeted (and yes, yes Lehman Brother collapses in the process). The free fall in S&P500 was to some extent curbed by relatively steep interest rate reductions in the Autumn of 2008 from all of the major central banks in the world. However, the drop in the US stock markets did not come to an end before March 2009. However, from March-April 2009 the US stock markets recovered strongly and the recovery continued all through 2009. So what happened in March-April 2009? Did all investors suddenly out of the blue become optimists? Nope. From early March the Federal Reserve stepped up its efforts to improve its role as lender-of-last resort. The de facto collapse of the Fed primary dealer system in the Autumn of 2008 had effective made it very hard for the Fed to function as a lender-of-last-resort and effectively the Fed could not provide sufficient dollar liquidity to the market. See more on this topic in George Selgin’s excellent paper “L Street: Bagehotian Prescriptions for a 21st-Century Money Market”. Here especially the two things are important. First, the so-called Term Auction Facility (TAF). TAF was first introduced in 2007, but was expanded considerably on March 9 2009. This is also the day the S&P500 bottomed out! That is certainly no coincidence. Second, on April 9 when the Fed announced that it had opened dollar swap lines with a number of central banks around the world. Both measures significantly reduced the lack of dollar liquidity. As a result the supply of dollars effectively was increased sharply relatively to the demand for dollars. This effectively ended the first monetary contraction during the early stage of the Great Recession and the results are very visible in S&P500. This as it very clear from the graph above the Fed’s effects to increase the supply of dollar liquidity in March-April 2009 completely coincides with the beginning of the up-leg in the S&P500. It was not animal spirits that triggered the recovery in S&P500, but rather easier monetary conditions. The dollar swap lines expired February 1 2010. That could hardly be a surprise to the markets, but nonetheless this seem to have coincided with the S&P500 beginning to loose steam in the early part of 2010. However, it was probably more important that speculation grew in the markets that global central banks could move to tighten monetary conditions in respond to the continued recovery in the global economy at that time. On January 12 2010 the People’s Bank of China increased reserve requirements for the Chinese banks. In the following months the PBoC moved to tighten monetary conditions further. Other central banks also started to signal future monetary tightening. Even the Federal Reserve signaled that it might be reversing it’s monetary stance. Hence, on February 18 2010 the Fed increased the discount rate by 25bp. The Fed insisted that it was not monetary tightening, but judging from the market reaction it could hardly be seen by investors as anything else. Overall the impression investors most have got from the actions from PBoC, the Fed and other central banks in early 2010 was that the central banks now was moving closer to initiating monetary tightening. Not surprisingly this coincides with the S&P500 starting to move sideways in the first half of 2010. This also coincides with the “Greek crisis” becoming a market theme for the first time. By mid-2010 it had become very clear that talk of monetary tightening had bene premature and the Federal Reserve started to signal that a new round of monetary easing might be forthcoming and on August 27 at his now famous Jackson Hole speech Ben Bernanke basically announced a new round quantitative easing – the so-called QE2. The actual policy was not implemented before November, but as any Market Monetarist would tell you – it is the Chuck Norris effect of monetary policy: Monetary policy mainly works through expectations. The quasi-announcement of QE2 on August 27 is pretty closely connected with another up-leg in S&P500 starting in August 2010. The actual upturn in the market, however, started slightly before Bernanke’s speech. This is probably a reflection that the markets started to anticipate that Bernanke was inching closer to introducing QE2. See for example this news article from early August 2010. This obviously is an example of Scott Sumner’s point that monetary policy works with long and variable leads. Hence, monetary policy might be working before it is actually announced if the market start to price in the action beforehand. The upturn in the S&P500 lasted the reminder of 2010 and continued into 2011, but commodity prices also inched up and when two major negative supply shocks (revolutions in Northern Africa and the Japanese Tsunami) hit in early 2011 headline inflation increased in the euro zone. This triggered the ECB to take the near catastrophic decision to increase interest rates twice – once in April and then again in July. At the same time the ECB also started to scale back liquidity programs. The market movements in the S&P500 to a very large extent coincide with the ECB’s rate hikes. The ECB hiked the first time on April 7. Shortly there after – on April 29 – the S&P500 reached it’s 2011 peak. The ECB hiked for the second time on July 7 and even signaled more rate hikes! Shortly thereafter S&P500 slumped. This obviously also coincided with the “euro crisis” flaring up once again. The re-escalation of the European crisis got the Federal Reserve into action. On September 9 2011 the FOMC announced that it would keep interest rates low at least until 2013. Not exactly a policy that is in the spirit of Market Monetarism, but nonetheless a signal that the Fed acknowledged the need for monetary easing. Interestingly enough September 9 2011 was also the date where the three-month centered moving average of S&P500 bottomed out. On September 21 2011 the Federal Reserve launched what has come to be known as Operation Twist. Once again this is certainly not a kind of monetary operation which is loved by Market Monetarists, but again at least it was an signal that the Fed acknowledged the need for monetary easing. The Fed’s actions in September pretty much coincided with S&P500 starting a new up-leg. The recovery in S&P500 got further imputes after the ECB finally acknowledged a responsibility for cleaning up the mess after the two rate hikes earlier in 2011 and on December 8 the ECB introduced the so-called 3-year longer-term refinancing operations (LTRO). The rally in S&P500 hence got more momentum after the introduction of the 3-year LTRO in December 2011 and the rally lasted until March-April 2012. We are presently in the midst of a new crisis and the media attention is on the Greek political situation and while the need for monetary policy easing in the euro zone finally seem to be moving up on the agenda there is still very little acknowledgement in the general debate about the monetary causes of this crisis. 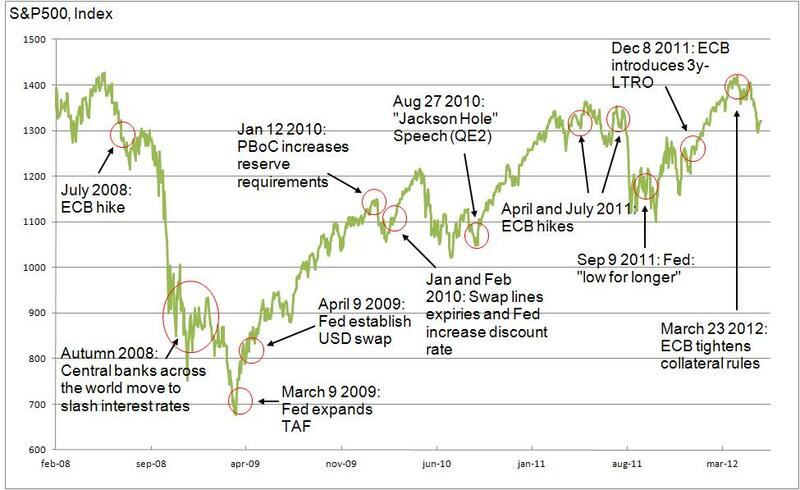 But again we can explain the last downturn in S&P500 by looking at monetary policy. Above I have tried to show that the major ups and downs in the US stock markets since 2008 can be explained by changes monetary policy by the major central banks in the world. Hence, the volatility in the markets is a direct consequence of monetary policy failure rather than irrational investor behavior. Therefore, the best way to ensure stability in the financial markets is to ensure nominal stability through a rule based monetary policy. It is time for central banks to do some soul searching rather than blaming animal spirits. This in no way is a full account of the causes of the Great Recession, but rather meant to show that changes in monetary policy – rather than animal spirits – are at the centre of market movements over the past four years. I have used the S&P500 to illustrate this, but a similar picture would emerge if the story was told with US or German bond yields, inflation expectations, commodity prices or exchange rates. I am sitting in Riga airport and writing this. I have an early (too early!) flight to Stockholm. I must admit it makes it slightly more fun to sit in an airport when you can do a bit of blogging. Anyway, I have been giving quite a bit of thought to the Jeff Frankel’s idea about “Peg to the Export Price” (PEP). What Frankel’s is suggesting is that commodity exporters like Russia should peg their currencies to the price of the main commodity they export – in the case of Russia that would of course be the oil price. This have made me think about the monetary transmission mechanism in an Emerging Market commodity exporter like Russia and how very few people really understand how monetary policy works in an economy like the Russian. I have, however, for more than a decade as part of my day-job spend quite a lot of time analysing the Russian economy so in this post I will try to spell out how I see the last couple of years economic development in Russia from a monetary perspective. In the present Russian monetary set-up the CBR manages the ruble within a fluctuation band against a basket of euros (45%) and dollars (55%). The composition of the basket has changed over time and the CBR has gradually widened the fluctuation band so one can say that we today has moved closer to a managed or dirty float rather than a purely fixed currency. However, despite of for years having had the official intention of moving to a free float it is very clear that the CBR has a quite distinct “fear of floating”. The CBR is not alone in this – many central banks around the world suffer from this rather irrational fear. This is also the case for countries in which the central banks officially pursue a floating exchange rate policy. How often have you not heard central bankers complain that the currency is too strong or too weak? With the ruble being quasi-fixed changes in the money supply is basically determined by currency inflows and outflows and as oil and gas is Russia’s main exports (around 80% of total exports) changes in the oil prices determines these flows and hence the money supply. Lets say that the global demand for oil increases and as a consequence oil prices increase by 10%. This will more or less lead to an 10% increase in the currency inflow into Russia. With inflows increasing the ruble will tend to strengthen. However, historically the CBR has not been happy to see such inflow translate into a strengthening of the ruble and as a consequence it has intervened in the FX market to curb the strengthening of the ruble. This basically means that that CBR is printing ruble and buying foreign currency. The logic consequence of this is the CBR rather than allowing the ruble to strengthen instead is accumulating ever-larger foreign currency reserves as the oil price is increasing. This basically has been the trend for the last decade or so. So due to the CBR’s FX policy there is a more or less direct link from rising oil prices to an expansion of the Russian money supply. As we all know MV=PY so with unchanged money-velocity (V) an increase in M will lead to an increase in PY (nominal GDP). This illustrates a very important point. Normally we tend to associate increases in oil prices with a supply shock. However, in the case of Russia and other oil exporting countries with pegged or quasi-pegged exchange rates an increase in the oil price will be a positive demand shock. Said in another other higher oil prices will push the AD curve to the right. This is also why higher oil prices have not always lead to a higher current account surplus in Russia – higher oil prices will boost private consumption growth and investments growth through an increase in the money supply. This is not exactly good news for the current account. The point that an increase in oil prices is a demand shock in Russia is illustrated in the graph below. 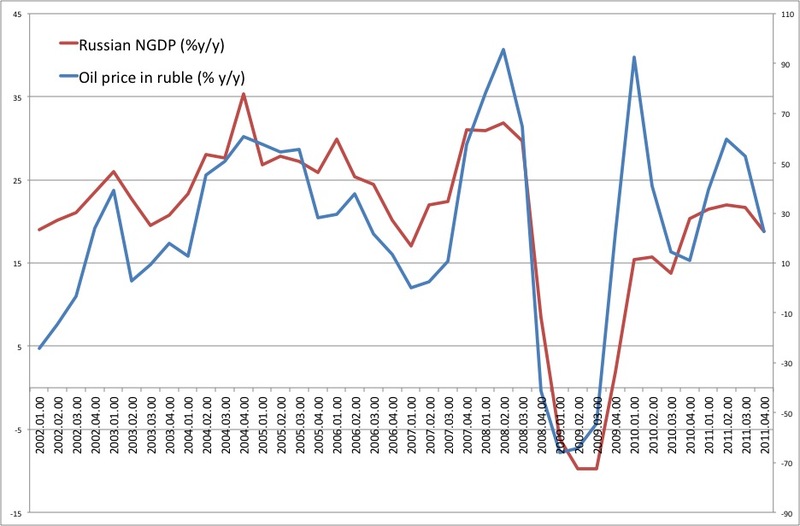 Over the past decade there has been a rather strong positive correlation changes in the price of oil (measured in ruble) and the growth of nominal GDP. This correlation, however, can only exist as long as the CBR intervenes in the FX market to curb the strengthening of the ruble and if the CBR finally moved to a free floating ruble then the this correlation most likely would break down. Hence, with a freely floating ruble the money supply and hence NGDP would be unaffected by higher or lower oil prices. So by allowing the ruble to appreciate when oil prices are increase it will effective stabilise the development the money supply and therefore in NGDP. Another way to achieve this disconnect between NGDP and oil prices would be to directly peg the ruble to the oil price. So an increase in the oil price of 10% would directly lead to an appreciation of the ruble of 10% (against the dollar). As the graph above shows there has been a very close correlation between changes in the oil prices (measured in ruble) and NGDP. Furthermore, over the past decade oil prices has increased around 20% yearly versus the ruble and the yearly average growth of nominal GDP has been the exactly the same. As a consequence had the CBR pegged pegged the ruble a decade ago then the growth of NGDP would likely have averaged 0% per year. With NGDP growth “pegged” by PEP to 0% we would effectively have had what George Selgin has termed a “productivity norm” in Russia where higher real GDP growth (higher productivity growth) would lead to lower prices. Remember again – if MV=PY and MV is fixed through PEP then any increase in Y will have to lead to lower P. However, as oil prices measured in ruble are fixed it would only be the prices of non-tradable goods (locally produced and consumed goods), which would drop. This undoubtedly would have been a much better policy than the one the CBR has pursued for the last decade – and a boom and bust would have been avoid from 2005 to 2009. (And yes, I assume that nominal rigidities would not have created too large problems). Anybody who visits Moscow will hear stories of insanely high property prices and especially during the boom years from 2006 to when crisis hit in 2008 property prices exploded in Russia’s big cities such St. Petersburg and Moscow. There is not doubt in my mind that this property market boom was caused my the very steep increase in the Russian money supply which was a direct consequence of the CBR’s fear of floating the ruble. As oil prices where increasing and currency inflows accelerated in 2006-7 the CBR intervened to curb the strengthening of the ruble. However, the boom came to a sudden halt in 2008, however, unlike what is the common perception the crisis that hit hard in 2008 was not a consequence of the drop in oil prices, but rather as a result of too tight monetary policy. Yes, my friends recessions are always and everywhere a monetary phenomenon and that is also the case in Russia! Global oil prices started to drop in July 2008 and initially the Russian central bank allowed the ruble to weaken. However, as the sell-off in global oil prices escalated in Q3 2008 the CBR clearly started to worry about the impact it would have on ruble. As a consequence the CBR started intervening very heavily in the FX markets to halt the sell-off in the ruble. Obviously to do this the CBR had to buy ruble and sell foreign currency, which naturally lead to drop in the Russian foreign currency reserves of around 200bn dollars in Q3 2008 and a very sharp contraction in the Russian money supply (M2 dropped around 20%!). This misguided intervention in the currency market and the monetary contraction that followed lead to a collapse in Russian property prices and sparked a major banking crisis in Russia – luckily the largest Russian banks was not too badly affected by this a number medium sized banks collapsed in late 2008 and early 2009. As a consequence money velocity also contracted, which further worsened the economic crisis. In fact the drop in real GDP was the latest among the G20 in 2008-9. As the Russian FX reserve was dwindling in the Autumn 2008 the Russian central bank (probably) realised that either it would cease intervening in the FX or be faced with a situation where the FX reserve would vanish. Therefore by December 2008 the CBR stepped back from the FX market and allowed for a steeper decline in the value of the ruble. As consequence the contraction in the Russian money supply came to an end. Furthermore, as the Federal Reserve finally started to ease US monetary policy in early 2009 global oil prices started to recover and as CBR now did not allow the rub to strengthen at the same pace of rising oil prices the price of oil measured in ruble increase quite a bit in the first half of 2009. The monetary expansion has continued until today and as a consequence the Russian economy has continued to recover. In fact contrary to the situation in the US and the euro zone one could easily argue that monetary tightening is warranted it in Russia. I hope that my arguments above illustrate how the Russian crisis of 2008-9 can be explained by what the great Bob Hetzel calls the monetary disorder view. I have no doubt that if the Russian central bank had allowed for a freely floating ruble then the boom (and misallocation) in 2006-7 would have been reduced significantly and had the ruble been allowed to drop more sharply in line with oil prices in the Autumn of 2008 then the crisis would have been much smaller and banking crisis would likely have been avoided. Therefore, the policy recommendation must be that the CBR should move to a free float of ruble and I certainly think it would make sense for Russia also to introduce a NGDP level target. However, the Russian central bank despite the promises that the ruble soon will be floated (at the moment the CBR say it will happen in 2013) clearly seems to maintain a fear of floating. Furthermore, I would caution that the quality of economic data in Russia in general is rather pure, which would make a regular NGDP level targeting regime more challenging. At the same time with a relatively underdeveloped financial sector and a generally low level of liquidity in the Russian financial markets it might be challenging to conduct monetary policy in Russian through open market operations and interest rate changes. As a consequence it might be an idea for Russia to move towards implementing PEP – or rather a variation of PEP. Today the CBR manages the ruble against a basket of euros and dollars and in my view it would make a lot of sense to expand this basket with oil prices. To begin with oil prices could be introduced into the basket with a 20% weight and then a 40% weight for both euros and dollars. This is far from perfect and the goal certainly should still be to move to a free floating ruble, but under the present circumstances it would be much preferable to the present monetary set-up and would strongly reduce the risk of renewed bubbles in the Russian economy and as well as insuring against a monetary contraction in the event of a new sharp sell-off in oil prices. …as I am finishing this post my taxi is parking in front of my hotel in Stockholm so now you know what you will be able to write going from Latvia to Sweden on an early Wednesday morning. Later today I will be doing a presentation for Danske Bank’s clients in Stockholm. The topics are Emerging Markets and wine economics! (Yes, wine economics…after all I am a proud member for the American Association of Wine Economists).